Freshen up your home with these hassle-free, quick and inexpensive decor changes. Many of us are continually looking around our homes and thinking it's time to make a few changes. A major overhaul may not be in the cards, just at the moment, but there must be some way to freshen up the interior of those four walls we call home! Actually, there are quite a few things you can do to give your home a spruce-up that neither cost much money nor take very long to do. Some of the following ideas may take a little longer than a couple of minutes, depending on whether you have help or not, but all can be accomplished in record time. And the difference they'll make to your home - and your spirits - will surprise you. Many of us habitually keep furniture, especially seating, shoved up against the walls, creating what one decorating wag called "the teen dance effect." 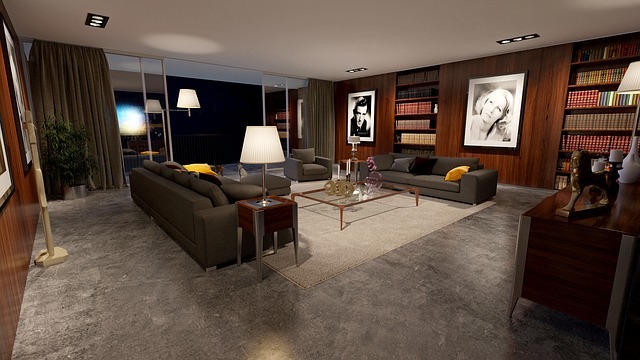 But creating space behind a large piece like a sofa actually makes a room feel bigger. Experiment with different positions: a sofa and two armchairs facing each other next to a focal point like a fireplace; on an angle near the corner of the room; or even just a couple of feet out from the wall. If the room is large enough, experiment with multiple seating areas, such as adding a couple of chairs and a lamp in the corner (or just one chair and a lamp - instant reading nook). Edit your accessories so that each individual piece comes into sharper focus. Remember, the space around decor items is as important as the items themselves. Rearrange your bookshelves so that they create blocks by size or colour of the spines. Place some horizontally as well as vertically to create visual interest. Try varying the blocks with open spaces, adding a few eye-catching accessories such as a conch shell or a framed photograph. If you don't have much time, just tackle one shelf at a time. Fill a large glass vase or bowl to the brim with colourful fruit such as oranges or lemons, and place on a side table or near the window. Switch around your artwork. It's astonishing how much moving a painting you've looked at for years into another room makes you appreciate it all over again. Place a wicker tray on the bathroom counter, line it with a hand towel, and use it to organize and display attractively packaged toiletries and soaps. Buy an inexpensive bouquet of spring blooms at the corner store, cut down the stems and place in a Mason jar, small vase or pretty glass for your bedside table. If you have a pair of matching scarves use them to replace the tiebacks on curtains. Many everyday items become art when you look at them in a fresh way. Pinecones gathered on a walk in the park are beautiful in a wooden bowl or wicker tray. White china makes a statement if arranged with care on open kitchen shelves. And you'll enjoy your collection of family photographs every day if you group them on the high wall next to your stairs. Try arranging them first on the floor till you get a pleasing composition.